This is the electronic version of this book. The PDF can be downloaded immediately after purchase.Contracts provide the formal written understanding between parties to a transaction. This book covers the need for contracts in international transactions, trade terms featuring Incoterms 2010, sample contract provisions, and recommendations for clearer language. Ten sample contracts and a legal glossary are also provided. Designed for both the non-attorney businessperson and practicing attorney. International Contracts provide the formal written understanding between parties to a transaction. 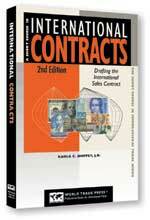 This book covers the need for contracts in international transactions, trade terms featuring Incoterms 2010, sample contract provisions, and recommendations for clearer language. Ten sample contracts and a legal glossary are also provided. Designed for both the non-attorney businessperson and practicing attorney. Contracts provide the formal written understanding between parties to a transaction. This book covers the need for contracts in international transactions, trade terms featuring Incoterms 2010, sample contract provisions, and recommendations for clearer language. Ten sample contracts and a legal glossary are also provided. Designed for both the non-attorney businessperson and practicing attorney.